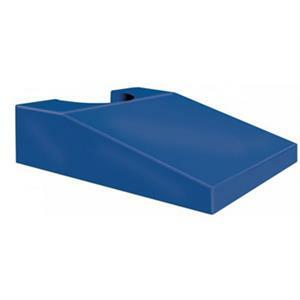 Reusable vinyl covered Endo ultrasound wedge is manufactured out of firm high-density urethane foam. This style features a durable heavy gauge reinforced royal blue vinyl outer covering. Sewn seams and tear resistant. These easy to clean wedges are radiolucent, but the seams will show. Provides excellent support for a wide variety of imaging and positioning needs. 20" x 20" x 6" tall. Unique perineal endovaginal wedge. 3" high base is manufactured from firm foam that provides maximum patient comfort and support. The unique angles incorporated into every sponge offers artifact-free imaging and increased stability.Anti-microbial: antibacterial and antifungal. Self-deodorizing. Wedge is made of a COATED light green Stealth-Core High-Density polyurethane foam which provides extra firm support for ultrasound procedures. A proprietary medical grade coating creates a unique skin membrane that is durable and easy to clean. 20" x 20" x 3"
Unique perineal endovaginal wedge. 6" high base is manufactured from firm foam that provides maximum patient comfort and support. The unique angles incorporated into every sponge offers artifact-free imaging and increased stability.Anti-microbial: antibacterial and antifungal. Self-deodorizing. Wedge is made of a COATED light green Stealth-Core High-Density polyurethane foam which provides extra firm support for ultrasound procedures. A proprietary medical grade coating creates a unique skin membrane that is durable and easy to clean. 20" x 20" x 6"